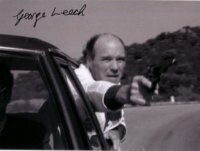 The Unmutual Website is sad to announce that George Leech, stuntman on "The Prisoner" who portrayed one of the security guards in "The General", passed away in June 2012. He was 80. A highly respected stuntman, he is best known for his work on various blockbusters including several James Bond Films and supervising the stunts on the drama series "Gangsters". TUW would like to extend its sincerest sympathies to George's family and friends. A full obituary can be read HERE. With thanks to David Stimpson for this news item.